A new album that I’m enjoying. 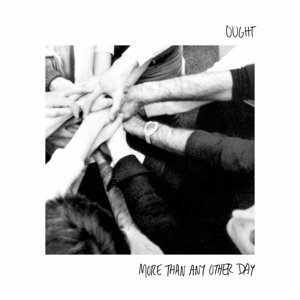 Could be coincidence that I’ve been listening to Talking Heads - Fear of Music and also digging this new album by Ought - More Than Any Other Day. There’s a track ‘Habit’ on MTAOD that Talking Heads could be proud of if they were still making great music. Maybe sprinkle in a touch of the Pixies on that one. I see ‘post-punk’ attached to the band. I’m not entirely sure what post-punk is supposed to mean. But here’s a few snips of what others say. Drowned in Sound “But here’s the payoff: although Ought meld proto-hipster touchstones like Richard Hell, the Modern Lovers, Shellac and Talking Heads, they completely reject snideness. In fact, it all translates with such empathy and euphoria as to suggest something subversive to modern indie, that hipness isn’t a quality to patronise or covet, and that maybe our resistance to being pigeonholeable or passé is precisely why we’re so confused and lonely.” << sounds like you could write a thesis figuring out what this is supposed to mean. Clash “this is music that’s made to make a difference, or else turn in ever-decreasing circles until it consumes itself. It has too much fire to not either spread or self-combust entirely.” << a bit of an oversell. Pitchfork, on the other hand, loved it. I like the spirit, the humor even in the album. One of the few things I’ve listened to that I’ve put on repeat. There’s several really good tracks. The aforementioned ‘Habit’ and the nearly title track “Today More Than Any Other Day”. The album captures a lot of what I’ve liked of other more avant garde acts like the Pixies (brashness), Talking Heads (quirk and honesty), Modest Mouse vocal, jangle)…Velvet Underground (drone) ,Violent Femmes (humor, loneliness). What I hope is that the blend of anxiety and sincerity and love of life sets them apart. It’s a debut and by that standard its a great debut.